The art world continues to throw many of the most unexpected developments in 3D print our way. After yesterday’s news about Swedish artist Mikael Genberg’s plan to fire a self-constructing, 3D printed cottage to the surface of the moon, comes the story of Diemut Strebe’s 3D print of Vincent Van Gogh’s severed ear, made from the DNA of one of the Dutch painter’s living relatives. Strebe, one of a growing number of international artists working in the area where science and art connect, used living cells from Lieuwe Van Gogh, the great-great grandson of Vincent’s brother Theo, to craft the famous organ. Lieuwe shares 1/16th of the post-impressionist genius’ genetic material, plus the Y chromosome that passes through the male members of the family. 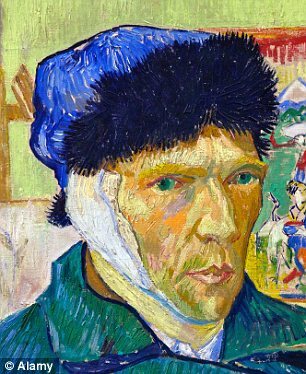 3D printing allowed Strebe to replicate the shape of the auricle Van Gogh chopped from the side of his own head in a fit of angry psychosis after best buddy and flat-mate Paul Gauguin told him he was moving to Paris in 1888. He must have really needed Paul’s half of the rent. So the story goes, Vinnie then popped down to the local brothel and handed the blood-soaked lug to a woman who worked there. Why didn’t he just give her money? It probably would have made for a more comfortable evening. Anyway, Strebe had originally wanted to use DNA taken directly from the great man himself, though was thwarted when the intended source of said genetic material (an envelope addressed to Van Gogh) turned out to be false. She turned instead to the Van Gogh family tree and was happy to find Lieuwe, who was keen on the project from the off. The ear is on display at the Centre for Art and Media in Karlsruhe, Germany until July 6 where visitors are invited to speak into the disembodied ear using a microphone. You can talk to the ear. The input sound is processed by a computer using software that converts it to simulate nerve impulses in real time. The speaker remains in soliloquy. The crackling sound that is produced is used to outline absence instead of presence. So, while you might see this as an opportunity to share your darkest secrets with one of history’s most revolutionary creative minds, in truth you may as well be reciting a bus timetable. Still, it’s a barmily welcome addition to the burgeoning canon of 3D printed art. American readers that would like to check out Strebe’s creation will have to wait for next year when the lug will go on display in New York.